As part of the cost-saving measures announced after Maersk Group’s first quarter $239m loss, its container arm has taken the knife to its feeder service network and reverted to a policy of commercial feedering. During the Danish transport group’s Q1 earnings call in May, Maersk Line’s chief operating officer, Soren Toft, promised “a number of capacity reductions over the next two quarters”. This has resulted in a new tender for the UK west coast and Irish Sea services. Irish cargo transhipments over Antwerp, Rotterdam, Felixstowe and Le Havre have been variously handled by a number of feeder operators, including X-Press, Samskip, Eucon, BG Freight and its own chartered tonnage, along with intra-Europe subsidiary Seago. One Dublin industry contact told The Loadstar Maersk’s procurement officers had demanded rate cuts in exchange for an exclusive deal. “None of the feeders could afford to lose the Maersk contract, so they were all sucked into the bidding process,” he said. “They are all struggling because of the rise in fuel costs, and higher daily hire charter rates for their ships, but the deepsea boys have refused to accept bunker surcharges,” he said. Last week Maersk confirmed that UK west coast and Irish Sea containers, including those of Hamburg Süd and Safmarine, would be carried exclusively by Rotterdam-based BG Freight. Peel Ports-owned BG operates up to nine feeder ships a week between Rotterdam, Antwerp, Cork, Dublin, Belfast and Liverpool. Some of the ships deployed will be operated in a co-loading agreement with competitors Samskip and Eucon. He added that, with this type of exclusive deal, BG would affectively be offering Maersk a dedicated feeder service and thus the carrier would heavily influence its schedules, which could be detrimental to BG’s door-to-door domestic business. Nevertheless, BG Freight will regard the contract with Maersk as invaluable base traffic to sustain its services, and with which it can add higher paying top up cargo. 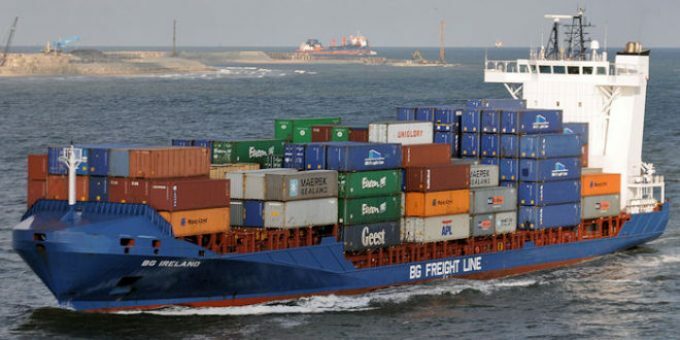 Meanwhile, it is understood that BG Freight has dropped its Felixstowe to Ireland liner feeder connection due to severe berthing delays at the UK east coast port as a consequence of the port’s IT terminal operating system disruption.